This campaign is set ten years after a previous set of adventures (HERE). This is the eighteenth session of the current campaign (Session 17 can be found HERE). It was an interim session conducted online. The party had just fought Bone Breaker, after attacking his boat with Thunderbolt Balls and forcing his heroes ashore. They killed him, his Flying Phantom assassins, cut off the hands of his ally Abbot Firebrand and forced Zhang Kang (a giant monstrosity working with Bone Breaker) to surrender and flee west). From Abbot they learned that Bone Breaker was on a mission to 'invert heaven' by restoring the Demon Emperor. He had just obtained a talisman that would enable him to get closer to his goal by stealing the Key of Yao Feng from Red Mountain Villa (the talisman was a kind of teleportation device). The party had just left the city of Yuizhing, where they tried to destroy the emperor's lacquered heart boxes (an act that would destroy him demon bodyguards), but the hearts they found were fake and part of an ambush. They learned that the real heart boxes were in Fan (a city to the north east). Abbot Firebrand revealed that they were inside the Statue of the Bold King. Min had cut off Abbot's hands and when he recovered he pleaded with the party to take Bone Breaker's body for proper burial. They refused but he promised to cooperate if they did as he asked. As a sign of good faith he told them that Bone Breaker had two important letters in his armor vest. Inspection this body they found two letters. The first was from the Senior Grand Councilor of the Empire. It instructed him how to safely take the Face of Vaagu from the Kailing (by using a scroll to contain the energy from Iron Sky Realm). It also revealed that Bone Breaker was under an agreement with Heavenly Palace Sect and had promised to send his son into Yao Gong Palace with the Heart of Yao Feng before his 18th birthday. This would result in his son becoming the demon emperor. The penalty for failure was his son's death. The other letter was from Bone Breaker's son, Zhang Yong. The letter expressed the son's belief that his father intended to betray the Senior Grand Councilor and had some sort of plan to get around their arrangement with Heavenly Palace Sect. He expressed gratitude, admiration and a willingness to obey his father. He also said he was happy that his father had finally returned to the righteous path. Abbot also explained that the statue was well protected, that it was really a likeness of the Demon Emperor and that the interior walls could absorb intruders and turn them into iron guardians. The third or fourth floor of the statue had two boxes with parts of a key that could open the heart boxes (contained in the head of the statue). The party decided to take Abbot with them to Fan. They went by boat and when they arrived immediately set out investigating the town. In the middle of the settlement was the Lake of Rebirth, where the sunken remains of Old Fan rested below the waters. According to locals, anyone who went near the lake would be drowned by water spirits. The only people spared by the ghosts were descendants of the original king (the current King resided in an island in the middle of the lake). Kang went to The Tower of Good Fortune, a gambling hall run by Master Pan. He approach Master Pan and asked to hire thieves to help him break into the Statue. The master agreed and gave him three men for 15,000 spades. However on their way to the statue, the men drew their swords and tried to detain Kang. He killed them and fled. Later he saw Master Pan issuing orders to guards with spears, learning that he was the chief of a ward in the city. 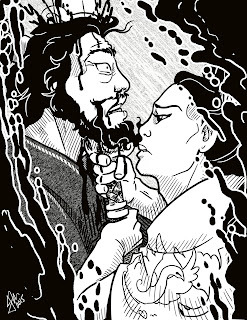 He snuck into the Tower of Good Fortune while Master Pan was bathing, and slit his throat. Rong went to Menzi's Wine Shop and learned more about the waters at the Lake of Rebirth. She also learned some of the history. The men in the tavern told her that the old city was flooded when Demon Emperor first appeared nearly a thousand years ago. Zhi Zhu went to the Statue of the Bold King and spied on it for a while using her Stealth of the Spider Demon Technique. She learned that there were four guards out front who changed shifts every four hours. She also observed an Imperial official in black robes, who looked like a Yen-Li practitioner, inspecting the statue occasionally. Rong investigated the possibility of using the water from the lake to breach the statue (her reasoning was that if the old town was connected to the arrival of the Demon Emperor, perhaps the spirits were still angry and the water could be used to harm the statue). However as Rong approached the waters of the lake, she saw a shape with long black hair flowing beneath the surface, getting closer with every step she took. They decided to find a Yen-Li temple and hire a priest to help them (perhaps he would know a way to utilize the water). They went to Flowing Mirror Pavilion Temple where priest Mak and his wife Lau resided. The priest told them that the spirits of the water were dangerous and possessed people, but that it might be possible to find a person who had been possessed and get some information from them about the statue. For a fee he agreed to help them. Mak retrieved a magic lantern and his wife grabbed a bundle of rope, then they set out with the party. The lantern ticked and helped reveal the presence of spirits and demons. This eventually led them to a confused looking woman in the market. The party approached her saying they knew she was a spirit and eventually got her to speak. She told them that she might be able to temporarily block the statue's protective magic if she sacrificed herself on its grounds. She was willing to do this because she wanted revenge against the demon emperor. As they talked, the Yen-Li priest and his wife had snuck up on the group. The wife lassoed the woman and the priest began chanting as he unstopped a gourd at this belt. It was clear they were trying to trap the spirit, so Zhi Zhu used arms of silk to tie up both of them. As the rest of the party secreted the woman away, Kang negotiated with the priest, explaining they just needed a little help from the spirits. The priest protested that the spirit was evil and needed to be destroyed, but eventually relented. He gave Kang a coin and said he would give them a day if he put the coin on her person so the couple could track her later. Having one spirit in their service, they decided it might be beneficial to acquire another. So they scoped out the statue again and began making note of the guard's habits. Zhi Zhu found one who seemed unpleasant and cruel and followed him home. When she heard sounds of violence from inside his home, she ran in and grabbed him with arms of silk, then pulled him into an alley where she knocked him out. Kang dragged the man to the lake and dropped him in the water. When he surfaced he was confused but the spirit woman touched his arm and said "we are going to destroy the Demon Emperor now". He nodded and agreed to help the party. Kang followed another guard and got drunk with him. He helped the man stumble home and stole his uniform. The plan was for Kang to go in with the Spirit Man and get to the heart boxes without setting off any of the protective wards. At the appointed time the woman would rush the entrance to neutralize the statue's powers. Before they approached the statue, Zhi Zhu spied on the temple where the official had been staying (about 200 yards from the statue). She snuck in when he was sleeping and stole his seal. This was a box for placing orders inside. Bringing this back to the party, they put an order for a guard to retrieve a heart box. Kang and the spirit man went in dressed like soldiers and walked up the spirals stairs on the interior. On the third floor there was another guard, who they presented the talisman to. He read the order and retrieved the key halves, telling them they had fifteen minutes. They went up to the head. Rong, positioned on the ground, grabbed two thunderbolt balls and used great stride to enter the statue through the eye socket. As soon as she appeared, two lashing cables appeared from the statue wall and struck at her, but she whirling dodged out of the way. She immediately used Great Stride to leave. Kang hid the Thunderbolt Balls as the guard from below came up to ask about the racket. Kang said "a couple of birds flew in and set of the protective device". The guard muttered something about it begin the second one that month and returned to his station. They lit the Thunderbolt Balls. The Spirit Man stayed behind, readying a dagger to do himself in. Kang Flew out the eye socket, and was nearly cleaved by a blade trap. He then released a divine powder signal, and the woman charged the guards at the entrance. The head exploded and the party fled from the city. They later circled back and Zhi Zhu spied on the statue grounds. The official, who they had determined was Senior Grand Councilor Cai Yuanyu at this point, had the guard who was protecting the key beheaded as men brought down bits of ash and fragments of wood for him to inspect. It appeared they successfully destroyed most or all of the heart boxes. The Senior Grand Councilor went back to the temple so Zhi Zhu followed him. He met with a man who looked like a martial expert, and the man took a horse to go north. The party followed him and eventually trapped him by a river. They captured him and he revealed he was going to kill the emperor and steal something from around his neck. He talked the party into helping him, explaining that he was appointed some time ago as an emergency replacement for the emperor's Yao bodyguard. This would allow him quick access to the palace and he could bring the party in with him. They figured the object from the emperor was the Heart of Yao Feng (or something equally terrible) and said they couldn't allow it. The man, who said his name was Wei, understood and suggested they form a pact, where they help each other kill the emperor, agree not to fight until that task was complete. Kang proposed that they work together against the emperor and that the two of them duel for possession of the necklace. The man agreed and they made a formal vow. In the past, most of my martial arts campaigns were run sporadically, a short stint into oriental adventures, or my own home brew with bits and pieces from d20, bits of GURPS and other games like Hong Kong Action Theater. I rarely found any one game system had exactly what I wanted, so I'd freely cobble stuff together as needed. This shorter length felt natural, to me the same way running a horror adventure from time to time felt natural. I liked doing mini-campaigns about once or twice a year because I was into martial arts and I liked watching different kinds of martial arts movies. I assumed for most players, an excursion into Kung Fu or wuxia was okay once in a while, but most wanted to return to bog-standard fantasy eventually. So I would tend to run my martial arts campaign settings for a few months at a time. That changed around five years ago or so when I decided to try to make martial arts more a part of my regular campaigns. I've been running wuxia campaigns and fantasy campaigns with heavy wuxia elements now for a while and they've become my default. Particularly with my Wandering Heroes of Ogre Gate groups over the last two years or so, I've learned a lot about keeping these kinds of campaigns alive. This is just a list of things I've observed. 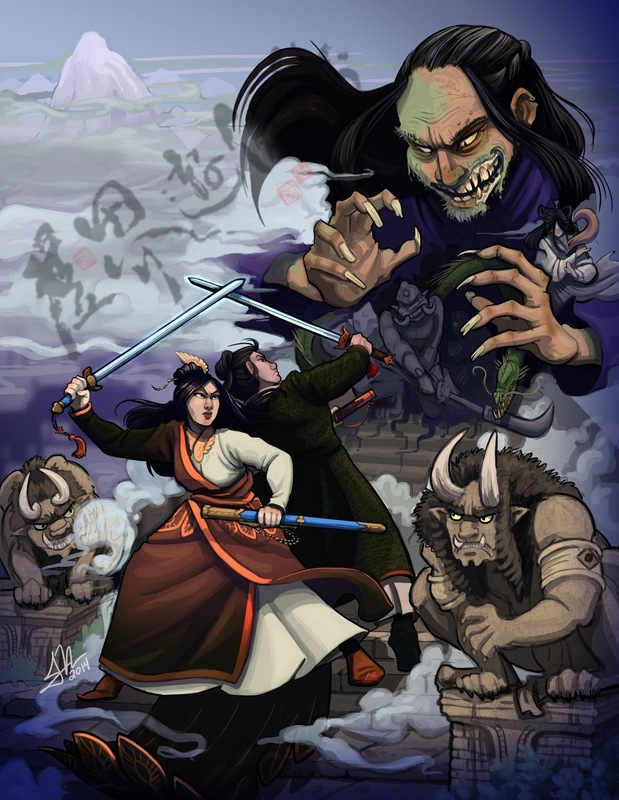 Some of them are specific to the Wandering Heroes of Ogre Gate system or games that employ similar approaches to Kung Fu techniques, others are more general. It's easy to go into a wuxia game thinking it needs to be this impossible thing to run that perfectly emulates the genre. In reality it is a lot like other genres that get transported to the RPG medium, and it's a perfect fit in that respect. We called our game Wandering Heroes of Ogre Gate for a reason, because wandering heroes are a staple of the genre. You can't get much more D&D than characters wandering through the wilderness, from city to town, etc. Add to that elements like secret Kung Fu Manuals, corrupt officials, larger than life villains, feuding sects and you almost don't need to prepare; adventures just unfold after you drop the PCs into the setting. Plus if you bring in the supernatural sub-genres (Hopping Vampires, Fox Demons, Immortals, etc), you open the door to more stuff that's a perfect fit for an RPG. My advice is don't hold back on the supernatural elements unless you are aiming for more pure wuxia or kung fu game. Sometimes wuxia campaigns are a tough sell. It is likely that a number of players in your group are not familiar with the wuxia genre or have misconceptions about it. I observed that the more they learn and understand the key assumptions behind most of the martial arts and magic, the more comfortable they get with it (it just becomes less random to them). They also start to notice wuxia more. Players who might in the past have glanced over martial arts titles at Target or Netflix, mention to me that they notice and check them out. I used to be very involved in martial arts and that was my biggest impediment to running a good martial arts heavy campaign. There was a gulf between me and my players, because I was thinking in terms of real-world martial arts and they just wanted the fun stuff they encountered in the movies. When I stopped worrying about real martial arts, is when things improved for me. That may not be everyone else's experience but it was mine. Wuxia and similar subgenera are different from standard fantasy, but you can still bring all the basic elements of an RPG adventure to the table. Dungeons work fine in a wuxia setting, and you'll find plenty of inspiration for them in movies and shows like versions of Condor Heroes, Dragon Swamp, A Chinese Odyssey, and The Bride with White Hair. Wilderness exploration is a perfect fit. Finding secret manuals or artifacts are an easy McGuffin to fit into a dungeon adventure. Mysteries and investigations work well too. So does political intrigue. If you are more interested in combat and tactics, for obvious reasons it is a good match but you can always take a more cinematic approach here. It is going to be different in a lot of ways from a standard game. 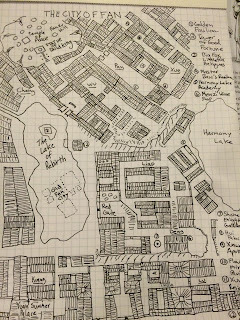 Most of the tools and adventure structures GMs are familiar with work just fine though. There are elements specific to the genre that afford interesting adventure and conflict opportunities. Martial Sects are a noteworthy example. How sects are handled really shapes a campaign. It opens to the door to politics and intrigue and pits adventuring parties against potential rivals or competitors. That players are often connected to a particular sect creates interesting complications (especially if members of the party are from different groups). This is somewhat specific to the system I've been using and to similar approaches (where techniques are individual abilities), but there is an escalation of Kung Fu Techniques that adds a lot to play. A common thing you see in the movies is a hero encounters an unbeatable move and has to figure a counter or way around it. I look at the established Kung Fu Technique list in the game as a starting point, and assume that martial arts are always evolving in the setting as masters try to outdo each other's techniques. The Rising Phoenix Strike may be the most feared technique at the moment, but in a few years another great martial expert might figure out its weakness and outdo the Phoenix Sect. As a GM I am constantly creating new techniques as a response to NPCs getting beat, going back to their sect and trying to formulate a reply to the Player Character's astonishing Kung Fu. By the same token, players do this as well. Movies are are obviously very important sources of inspiration. I've based entire adventures on films like Come Drink with Me or The Dragon Chronicles (The Maidens of Heavenly Mountain). However wuxia and mythic series are much longer and can go into greater detail. I find watching those really helps with getting cool adventure ideas. There are a lot of classic shows available online, and new ones are coming out fairly regularly. When I think of the wuxia genre, the thing that pops into my mind are the stark characters. Sometimes they are drawn so starkly, it puts them on a wonderful collision course with doom. For me, this is what drives most of my campaigns on and on: the PCs, the NPCs, the sects, the conflicts and schemes that flow from them. This doesn't mean adventure structures are all about characters interacting; it just means it is the fuel. All kinds of adventures can arise from this (everything from wilderness exploration to dungeon crawls and investigations). With King Diamond coming to perform in Boston tonight at the Orpheum, I've been revisiting my old King Diamond and Merciful Fate albums. King Diamond was an important part of my evolution as a young metal head. I progressed from hard rock like Guns N' Roses and Led Zeppelin to Iron Maiden, Black Sabbath and King Diamond before getting into much heavier stuff. King Diamond was important to me because like Iron Maiden, he always had a penchant for strong melodies and story. He might wedge melodic lines in between some bitter chords but they are definitely there. And that fondness for real melody remained with me, even as I got into heavier things. Also being a guitarist, I think the neoclassical sound of Andy LaRocque's playing was a natural fit. His concept album approach, where he tells a complete story appealed strongly to the gamer in me (something about listening to Abigail or Them while preparing Ravenloft adventures just worked). I liked that storytelling aspect to his music and I loved that they were basically horror movies put to music (I was also really into Hammer Movies, old Universal Films and silent horror movies at the time). 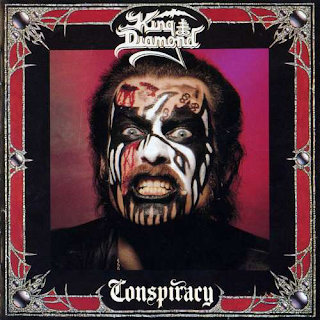 My first introduction to King Diamond was Conspiracy, which is a sequel to his album Them. That was a bit of a confusing intro, since it resumed the storyline from Them, but the sound and concept approach really piqued my interest as a listener. However, it wasn't until I picked up Abigail, his second album, that I became a lifelong fan. What was most striking to me was the melodies, particularly the stuff King Diamond did in falsetto (both in King Diamond and in Merciful Fate). If you've never heard King Diamond he is known for using a lot of different voices to bring characters in the story to life. His natural voice is more in the mid-range, but he mastered this shrieking falsetto that in my view no one has ever really been able to repeat to the same effect. And he used multiple tracks to, which allowed for harmonies on the vocals. He kind of oscillates between sounding like a Gremlin to sounding like a banshee. Anyone interested in getting a sense of the Merciful Fate or King Diamond sound should probably pick up the Dangerous Meeting Compilation. That will give a sense of the breadth of stuff they were doing. The melodies and choruses in a lot of cases could almost pass for pop or even motown but with a slightly perverse and baroque twist. Tracks like Behind These Walls have progressions that sound like a Bonnie Taylor Song. This is even more obvious with some Merciful Fate material. It is oddly sweet and bookended around shrieking and jagged riffs. These moments come in flashes but they are apparent (in Evil, A Mansion in the Darkness, Shadows, Halloween, The Legend of the Headless Horseman, Father Picard, Gypsy, Into the Coven, Come to the Sabbath, No Presents for Christmas, etc). It is a strange combination of styles but it works. 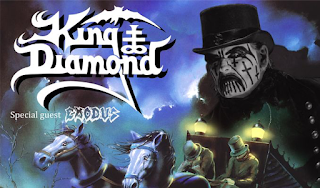 King Diamond is a master at crafting compelling melodies that stick in your head. I discovered Merciful Fate after I'd been into King Diamond for a while. This was back when you really didn't have the internet to tell you everything about the bands you wanted to follow. There were fan zines and a few magazines (but most metal magazines I remember from the time catered a lot to more popular hair band acts). People also passed around tapes but that was mostly for bands you couldn't find at stores. For the most part it was word of mouth and looking through the shelves at the record stores. 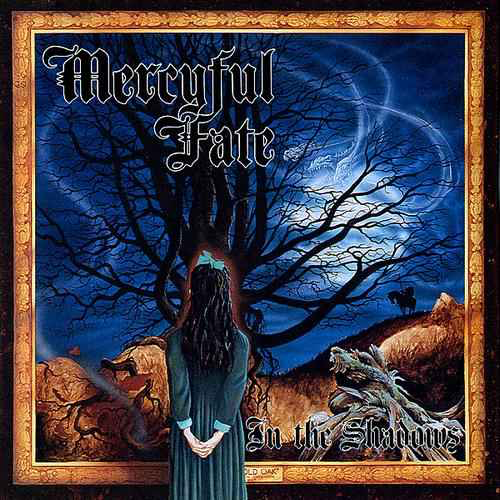 So at first I had no idea that Merciful Fate existed, and when I became aware of them (probably from posters or something), I didn't know King Diamond was their singer. However I learned about them at a good time because much of their old material was being released and they had an upcoming re-union album. 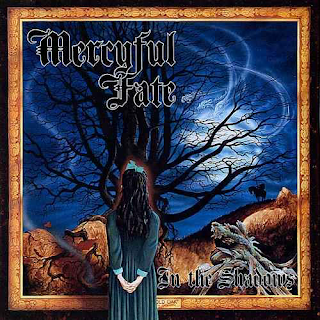 Merciful Fate is pretty similar to King Diamond's eponymous work except the guitar is a bit different and less concept material. It had many of the same members, including King Diamond, Michael Denner, and the bassist Timi Hansen. I think the primary difference in sound is the presence of Andy LaRocque in King Diamond, who added more of a Randy Rhoads sound to the lead. Merciful Fate came before King Diamond but he would re-unite with them and continue to release new material as he was also releasing solo work. Somehow I got my hands on their album, Don't Break the Oath. Soon after they released, A Dangerous Meeting, a compilation album of both King Diamond and Merciful Fate, and Return of the Vampire, quickly followed by In the Shadows (a surprisingly good comeback that I rank right alongside their first two records). I was hooked after that. As far as metal goes, King Diamond is fairly light by today's standards (more in the vein of British New Wave Metal but a tad harsher). His themes were always on the darker side and occult. But for me it was the guitar work and the vocal melodies that drew me in. As a teenager I played guitar in a death/doom metal band and while King Diamond was pretty far from that sound, and I had become interested in things heavier by that time, I still listened to a lot of his catalog (including the Merciful Fate material) because the riff work and the melodies inspired a lot of interesting ideas that gave us a more unique sound. A lot of the stuff I was listening to at the time was very heavy on the power chords, and the riffs tended to be power chord based, with frequent inversions and stacks. This is just a way of saying there were lots of harmonies and big, full sounding power chords. But that was pretty unwieldy and harder to do intricate riffs with because the stacked chords were big and the inverted power chords demanded careful planning. So I found by mixing it up with more of a Merciful approach to riffs (which is a better blend of smaller power chords and single note lines) I got a more varied and melodic sound. It basically allowed for moments of greater agility. For me this was a very conscious thing where I was trying to emulate their style. 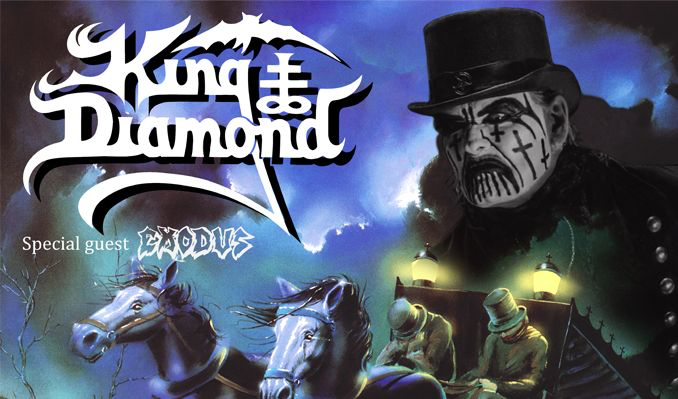 So I am glad to see that King Diamond is coming to Boston tonight. My understanding is this concert will be devoted to his classic album, Abigail. 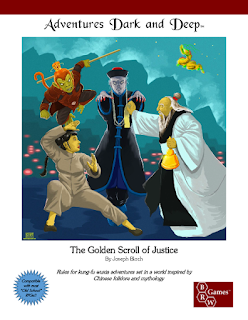 Joseph Bloch is releasing an OSR Wuxia RPG called The Golden Scroll of Justice. I had a chance to talk with him about the project and find out more about the project. The Golden Scroll of Justice is available HERE. Brendan Davis: What is The Golden Scroll of Justice? 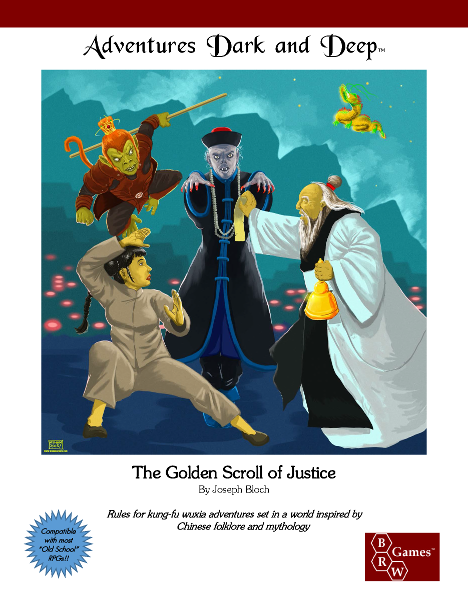 Joseph Bloch: The Golden Scroll of Justice is a rules supplement for old-school role-playing games, that helps the game master create a campaign setting based in the history, mythology, and folklore of ancient China, combined with the sensitivities and tropes of wuxia ("kung fu") films, television, and novels. It's sort of a reaction to the original "Oriental Adventures" supplement for AD&D back in the 1980's, which I felt was far too skewed towards Japanese culture. Not that I don't like ninjas and samurai, but that book gave the impression that "Oriental" meant "Japanese" and I wanted to write a book to counterbalance that impression. BD: Who did the cover and interior art for the project? JB: I'm fortunate to have a wonderful stable of artists that I've worked with in the past, but I'm also constantly looking for new artists to work with. For this project, a new (to me) artist, Khairul Hisham, did the color cover art, and a mix of familiar and new arists—Gennifer Bone, Christopher R. Conklin, Khairul Hisham, Eric Quigley, Jeshields, Cary Stringfield, Josephe Vandel—did the interior b&w art. BD: You describe the game as Wuxia/Mythic China. What can players and GMs expect in terms of flavor? JB: Mechanically, my hope is that it feels just as comfortable as any regular 1E-derived role-playing game. The mechanics are going to be familiar, so you can concentrate on the setting elements. In that sense, it should hopefully feel like entering a whole new world, with monsters, spells, and magic items that are completely unknown, and which derive from a culture that is going to be somewhat unfamiliar, and thus just a little...off...to an audience used to settings and trappings that are based on European or Classical mythology and history. And when you add kung fu to the combat system, it stays abstract, but there's also room for cinematic kung fu moves that will add a lot of "zing" to melee without throwing everything out of balance. BD: What were your major sources of inspiration? Were there any movies or books that were important to you when working on the project? JB: There's actually a listing of inspirational and source books and film in one of the appendices; my own "Appendix N" for the genre. But for me the first kung-fu movie I ever saw was the Five Deadly Venoms, back in the late 70's/early 80's, and that sort of over-the-top presentation of kung fu as this collection of specific, but interlinking, skills really stuck with me. Plus those wonderful masks. ::grin:: But of course there are also classics of Chinese literature, such as Journey to the West and the Outlaws of the Marsh, but I'm also very much a fan of folk-tales as a mirror of the beliefs of the common people. I did a lot of reading of collections of Chinese fables and folk-tales, and a lot of that is reflected in the book as well. BD: What were some of the challenges you faced designing Golden Scroll of Justice? JB: This is the longest book it's ever taken me to write; about three years start to finish. There were some philosophical and mechanical issues that I just couldn't work through, and the book got shelved more than once. Then I'd come back and tinker on the edges, and put it back on the shelf. But once I figured out how to handle kung fu, the whole thing snapped into place and just poured out of me. Also, I very consciously didn't want to place the book in any specific setting; the idea is for the game master to create their own setting from the material in the book, so there's no equivalent of Kara-Tur. Balancing that against the need to impart as much Chinese culture as I could was challenging, but I think I hit a good balance, based on the way the original D&D books handled European and Classical mythology and culture in terms of magic items, spells, classes, etc. without being bound by a particular setting. 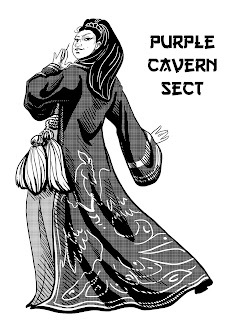 BD: What approach did you take in terms of mechanics to bring wuxia and mythic China to Adventures Dark and Deep? How does a Golden Scroll of Justice campaign/adventure differ from a more standard fantasy campaign/adventure? JB: Mechanically, aside from the cosmetic items such as the classes and armor types and such, the importance of the kung fu system, and the mechanics by which characters spend experience points to get skill levels in kung fu, rather than using those XP to gain levels. So, as a rule, a campaign using these rules is going to feature lower-level characters, although a 5th level fighter with three levels of kung fu skill is going to pack much more of a wallop than a normal 5th level fighter. In terms of campaigns, one of the great things about the wuxia genre in general is its adaptability. While there are certain themes (justice, the wandering hero, etc. ), the creativity and flexibility in how the genre is approached is nearly boundless. So you can have a campaign that's more focused on politics, or a war, or discovering lost secrets of kung fu, or fighting corruption, or whatever. In comparison with more standard fantasy games, I would think that there's a lot less emphasis on the dungeon crawl, and more on the wilderness adventure, but even there, the genre is flexible enough to encompass just about anything. BD: Were there any specific pitfalls you tried to avoid when designing the system? JB: I was very conscious that I wanted to do a supplement, rather than a stand-alone game, so the mechanical choices I made had to reflect that. I didn't want to create a large number of new game systems and mechanics; wherever possible I stuck with the familiar mechanics already present in the core game (and, naturally, in most other old-school games that are compatible with the original 1E or B/X versions), and simply added to them. BD: What do you like best about The Golden Scroll of Justice? JB: The core Adventures Dark and Deep rules use a skill system based on one created by Gary Gygax for Castles & Crusades. What really excited me about this project was the way I was able to take that skill system and radically expand it into the realm of combat; it forms the core of the kung fu system, which is not only completely consistent with the standard 1E-style combat system, which is very abstract, but allows the players and GM to include a lot of the special "cinematic" kung fu moves that most people associate with television and movies in the genre. A lot of the kung fu skill abilities came straight out of hours and hours and hours spent watching those films, and I think fans will really find something to like in it. 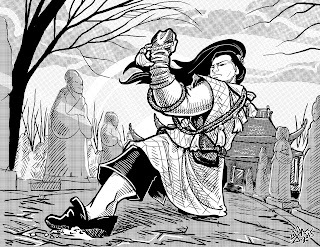 Plus, it's completely expandable, so any GM can create his own kung fu styles using the ones in the book as a template. It really worked out wonderfully. Joseph Bloch has been playing wargames and role-playing games since the mid-1970's. He is the author of the Adventures Dark and Deep RPG, an attempt to expand and develop 1E along Gygaxian lines, and Castle of the Mad Archmage, an immense old-school megadungeon adventure, along with various other role-playing projects. He is president of BRW Games, and runs the Greyhawk Grognard blog. 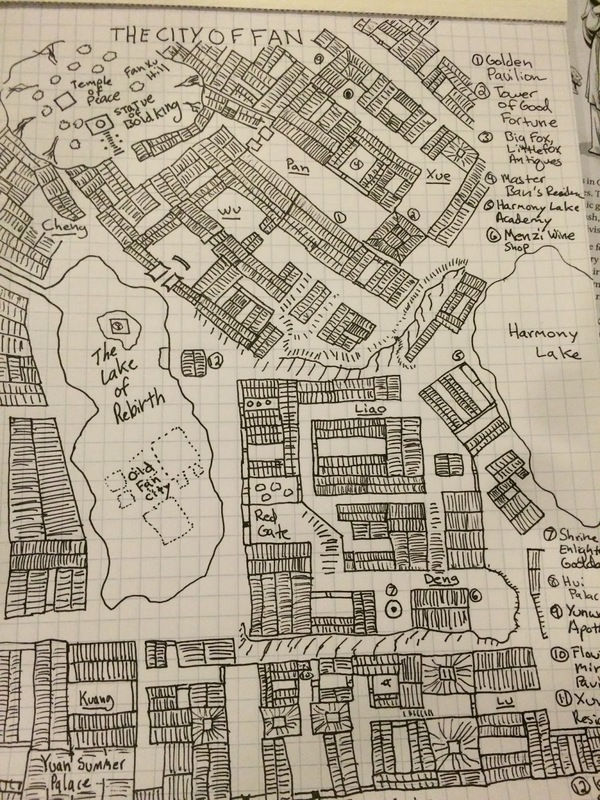 This is the campaign log for the eleventh session of a google+run Wandering Heroes of Ogre Gate campaign. The previous session is described HERE. Note: I am running two campaigns in the same setting and treating them as occurring in different realities with some vague similarities. Characters in one may appear in the other, but there are no direct causal effects from one campaign to the next. Partly this is to playtest, but this is also partly due to the multi-dimensional aspect of the universe I run all my games in. It would theoretically be possible for the party from the Blood of the Demon Moon cult campaign to dimension travel to the Secret of Je Valley Campaign, in which case direct interactions could occur (and they could even meet their counterparts in the alternate dimension). This was a one-player session. Bone Breaker began preparations to go west and retrieve the head of Vaagu. He also awaited the arrival of the Senior Grand Councilor Cai Yuanyu. He planned to bring 300 men with him initially but Jade Priestess was concerned this wasn't enough. Even the 600 he could muster wouldn't be able to deal with the thousands of Kailin horse riders they'd face at Vaagu. She had been conducting research and was aware of another gift the Demon Emperor could bestow that would help them defeat an army but the cost would be his arm. Bone Breaker thought about it and decided to perform the ritual. Jade Priestess cut off his right arm and he awoke a day or two later. Jade Priestess explained that she had made an appeal asking for him to be given the Wind of the Demon Emperor. He was vaguely aware that the power resided in him and could be used once per lunar cycle to wipe an army with air from his lungs. He also knew that it had to be a proper battle for the gift to work. Before he left, the Senior Grand Councilor came to the Ogre Gate Inn and stayed in camp outside. Bone Breaker met with him and discussed his plans. He also revealed that he had cut off his arm and lost years of his life in service to the demon emperor. The Senior Grand Councilor was impressed and explained that his aims were much grander than what Bone Breaker had in mind. He wanted to "invert heaven" by restoring the Demon Emperor. He believed it was fate that brought them together, because the Face of Vaagu was a key part of his plan. He instructed Bone Breaker to refrain from taking the face to Reckless Storm (his initial intent) and instead take it to the badlands of Yao, where they would meet again. The Senior Grand Councilor promised to handle Reckless Storm personally and to look into the matter of Bone Breaker's curtailed life span (he couldn't make any promises but said he would see if a solution existed). The Senior Grand Councilor told him to go to General Dee before heading west. He promised the general would present him with the Seal of the Demon Emperor as a reward for his service (a device that enables teleportation). In Yuzhing, Bone Breaker found General Dee's residence partially burned. The general explained that they had set an ambush for some meddlesome heroes, who managed to escape. Bone Breaker offered to track them down and kill them when he had time. The General was grateful and gave him the Seal of the Demon Emperor. Bone Breaker also asked the general for advice about marriage. The General suggested he consider marrying the daughter of an important sect leader, or perhaps the Little Venom of Zhaoze sect (whose father was a well known poisoner and martial expert). After meeting with General Dee, Bone Breaker returned to Ogre Gate Inn. From there he headed west and took nearly 600 men with him. He also brought a significant store of Divine Powder and Jade Priestess. They marched for seventeen days and finally reached the plains north of the Kailing Desert. There a tall and narrow stone formation rose high into the sky, the tip resembling a giant human head. This was the face of Vaagu. At the base of the Face of Vaagu was a Kailng encampment of about six thousand men. Bone Breaker approached, instructing Jade Priestess to command and prepare the forces in case anything went wrong. He had Sand Demon Burrow beneath the camp and asked if he could meet with their leader. They took him to the tent of Princess Samga, who was flanked by guards and sitting on a raised platform and throne. He said he wanted to work something out, that he needed to borrow the Face of Vaagu. This infuriated the Princess who immediately rejected the idea. Bone Breaker told her not to be hasty and signaled Sand Demon who sucked one of her men below the sand. Princess Samga promised to kill Bone Breaker, so he signaled Sand Demon to attack her. It burrowed beneath her and tried to drag her below the sand, but she flipped in the air and evaded its clutches. Bone Breaker then unleashed Spear Tip on Samga, which went threw her stomach and out the other side. Princess Samga leapt forward to knee him in the jaw but he spinning back kicked her and she crashed back on her throne, nearly dead. As Samga's men formed a line to protect her, Bone Breaker heard the sounds of war outside the tent. He used Spear Tip to threaten Princess Samga's life and took her hostage. Then he went outside and keeping the spear tip against her throat calmed the battle. The Kailin let him retreat with the princess to his side during the lull in fighting. He took Samga to Jade Priestess, and they debated a course of action. He decided to unleash the wind on the Kailin. Inhaling deeply, Bone Breaker blew a hot breeze across the encampment and watched as it tore away the soldier's flesh, leaving heaps of bone in its wake. This sent a murmur of fear through the ranks of his own men, but they quickly fell into line once he commanded them to take the Face of Vaagu. At first they tried to scale the rock formation so they could use Divine Powder to precisely explode beneath the head. However stone shapes attacked anyone who got more than fifty feet up and dozens of his men fell to their deaths. Instead Bone Breaker opted to blow up the base of the rock formation. When the Divine Powder was lit, there was an enormous blast and the Face of Vaagu came crashing to the ground, releasing a huge plume of dust and debris. Concerned that the Kailing settlement to the south would hear or see what happened, they quickly began dragging the face back the way they came. Bone Breaker also took the Princess with him and wrote a ransom letter to the leader of the Kailin, demanding he personally come to the Badlands with a quantity of wealth sufficient to reclaim the princess. It took nearly a month but they reached the badlands. This is where the session ended.